It's matte. A nice matte finish is the easiest way to make a pretty gadget. And the Kindle has horrible silver paint. The Kindle 3 was a nice rugged plastic. The Kindle 4 and Kindle Touch are painted silver, and it chips and scuffs way faster than the old finish, let alone the Nook's. It's better for extended reading. The Nook has the benefit of a wider bezel and an indentation on its back that makes it a hundred times more ergonomic than the flat-backed Kindle. It's got buttons. It's nice having the option, and they require a firm enough press that you won't press them by accident. I actually want to use it. The Kindle is a really nice device, but a lot of its advantages melt away when you get into actual, prolonged, and daily use. It's been months since I've even bothered to charge any of the Kindles, but the Nook is constantly in my bag or my jacket pocket, even though I have the same library on both. 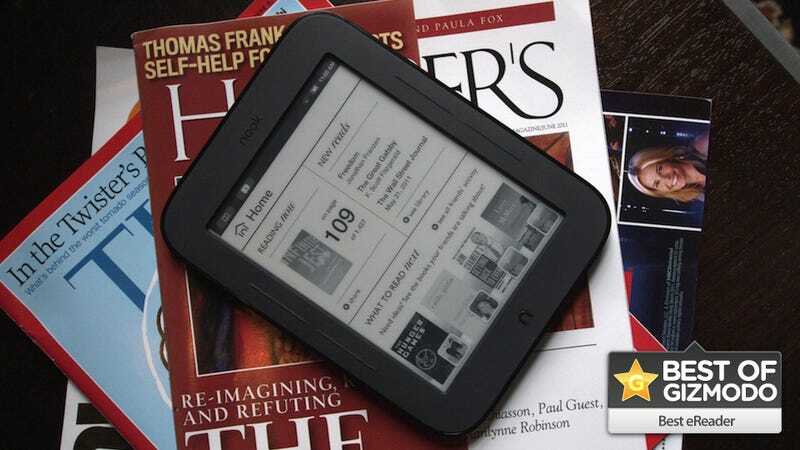 To be clear, this is focused on the experience of using the ereader as a piece of hardware, and not the ecosystem. Barnes and Noble's digital selection mostly keeps pace with Amazon's, with a few exceptions, but if you're going to bet on one of the two being around for the long haul, you'd definitely edge toward Amazon.